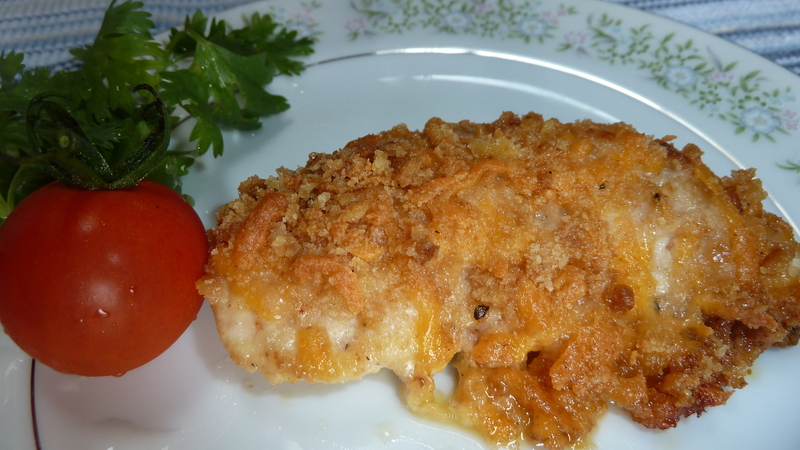 Cheesy chicken, cooking, easy chicken recipes, family, food, Recipes, Whatever Happened to Dinner? Okay, so it won’t win any awards from the health department. But if you round out the meal with freshly steamed broccoli or carrots or a California mix, your favorite vegetable or fruit salad, and maybe a rice pilaf, it moves up on the nutritional scale. I have made the cheesy chicken twice for large groups. 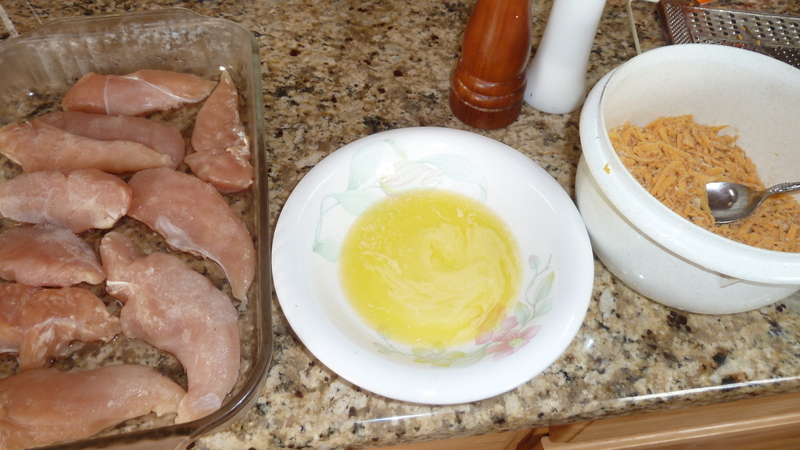 I wanted to have plenty of a main meat dish, so I also prepared baked chicken tenderloins covered simply with an Italian type dressing for those who preferred something lighter and not breaded. So that makes an easy menu alternative to offer alongside the cheesy chicken when serving a larger group. People seemed to like having a choice, and both were eagerly consumed, with a few leftovers from each choice. Mix crushed crackers and grated cheese together. Melt butter, place in bowl that you can dip chicken pieces in. 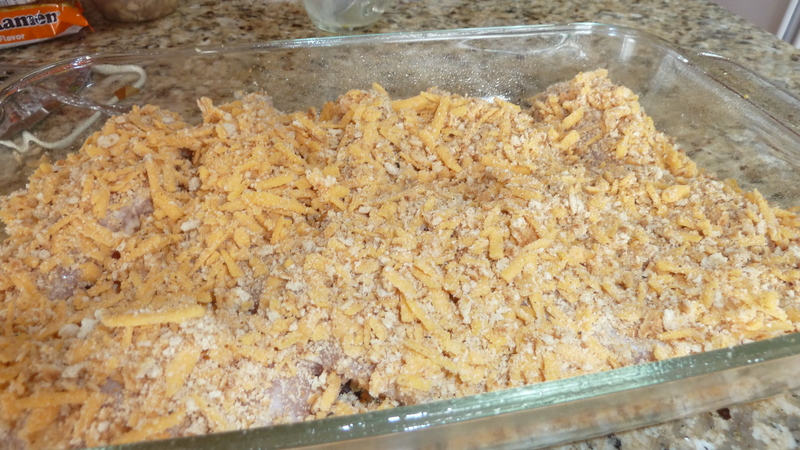 Dip each tenderloin first in butter, and then cracker/cheese mixture. Place in lightly sprayed 9 x 12 baking dish. Cover with remaining crumbs, as desired. You may end up with extra crumbs, depending on how big your chicken pieces are. Bake for 30-40 minutes in 350 degree oven. 1) As easy as this is, don’t screw it up the way I did one time, mixing the butter with the crackers and cheese. Globby mess. Don’t do it. 2) If your chicken pieces are frozen, the melted butter congeals very quickly on the frozen meat; better to use pieces that have thawed in the fridge and aren’t so cold. I also wrote about Barbara recently in an Another Way newspaper column, here. One of these days I’ll get one of her talented children to video her as she makes her oft-requested Shenandoah Valley Renowned Macaroni and Cheese. My book, Whatever Happened to Dinner? has some family favorites in it, but also recipes from a wider group of families from my office. I think the super easy factor with yummy cheese and butter would over-ride my guess about the high calorie content — at least once. Hubby would like it for sure! I’ll figure out the calorie count — I enjoy doing that and I used to do it all the time. I know you count calories, Marian. On a different note, I like your share of the retreat cabin on Chincoteague. Only been over there once when the kids were small and would love to get back. I made it! My husband LOVED it. Thanks! Passed the husband test. Great!